您的位置在： 主頁 Blog 有了這個app，那我們可以看到世界各地的不同street arts! 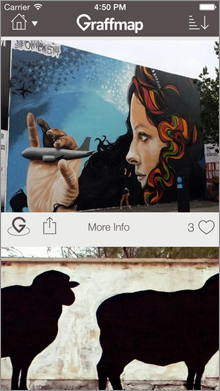 Graffmap is an app designed to allow users to share and discover street art from around the world. Graffmap is an iOS app that allows users to discover new graffiti while taking photographs and sharing what they find on the street. The app utilizes map technology to allow users to browse any area in the world. Wherever another Graffmap user has, for lack of a better word, tagged a piece of street art, you can click on the image and view a high quality photo. If you’re in the area, you can head over to that location and check it out in person for yourself. Although street art decorates tons of buildings around the world, Graffmap’s map is clean and not cluttered, making it easier to find the best pieces of art. If you come across street art on your travels or in your home city, you can capture an image on your phone and upload it to the map. Graffmapasks for three images in order to capture the art in more detail, as well as a description of what you saw and where you saw it. Some might be skeptical as to how Graffmap might be used by property owners or authority figures, but the reality is that street art is often wiped away within a few days. Graffmap helpspreserve street art for a longer period of time, while sharing it with those who can appreciate it.